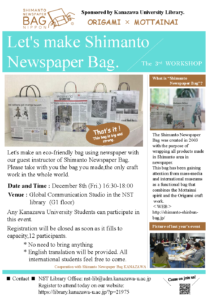 Let’s make an eco-friendly bag using newspaper while following the instructions given by our guest instructor of Shimanto Newspaper Bag. Please take with you the bag you made as one of a kind of craft work. 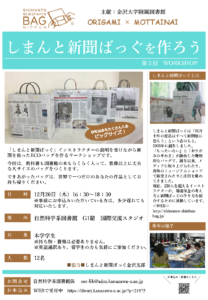 Registration will be closed as soon as if fills to capacity, 12 participants. ● English translation will be provided. All international students feel free to come. ↓申し込みはこちら　↓Please register from the following form.